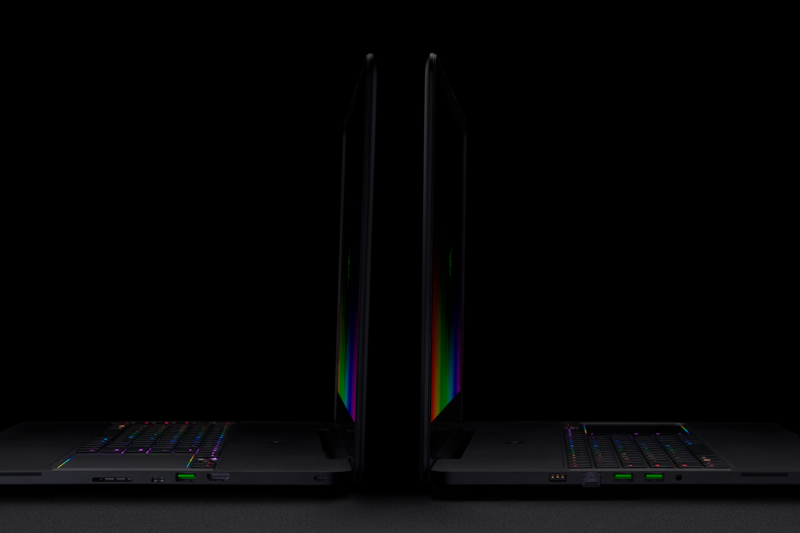 The world’s first THX® Certified Mobile Device, the Razer Blade Pro sets a new standard for desktop replacement laptops delivering an immersive experience in an incredibly thin form factor. Equipped with an overlocked 7th Gen Intel® Core™ i7 Quad-Core processor, NVIDIA® GeForce® GTX 1080 VR ready graphics, sporting a stunning 17.3-inch 4K UHD G-SYNC touch display, and a tactile ultra-low-profile mechanical keyboard powered by Razer Chroma™, the new Razer Blade Pro is the ultimate portable powerhouse. 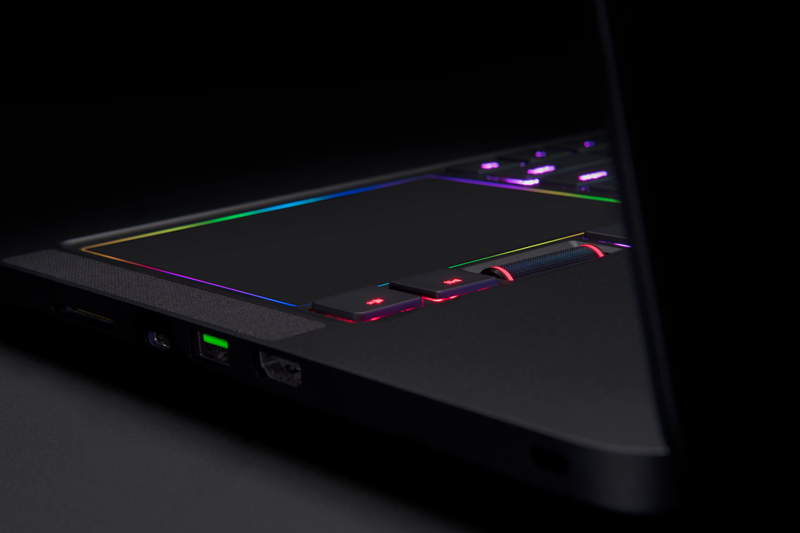 As the world’s first laptop to be a THX® Certified Mobile Device by the legendary audio/visual brand, the Razer Blade Pro delivers an immersive visual and audio experience unlike any other laptop. Display colors are pre-calibrated for accuracy, producing the best visuals for gaming, videos, and content creation. Hear every sound with high fidelity audio output through the headphone jack that covers the full range of human hearing. Display panels are tested for resolution, color accuracy, and smooth video playback. We collaborated closely with THX to ensure consistent image quality across the screen to deliver an unrivaled viewing experience found in no other laptop. In a joint effort between THX and Razer engineering, we tested for an undistorted audio output capable of driving high-performance headphones and speakers to deliver top-notch audio quality. These tests included frequency response, distortion, signal-to-noise, and crosstalk to ensure audiophile-quality performance with flat frequency response and low noise. Dominate any task with the extreme performance of the new overclocked 7th Gen Intel Core i7-7820HK Quad-Core processor. Enjoy high fidelity visuals and support of simultaneous 4K or 360-degree streaming videos on multiple displays. See improved performance and efficiency when storing, viewing, editing or sharing multiple projects. Get the best immersive VR gaming experience with up to 4 cores with hyper-threading technology and up to 3.9GHz of speed with Turbo Boost. 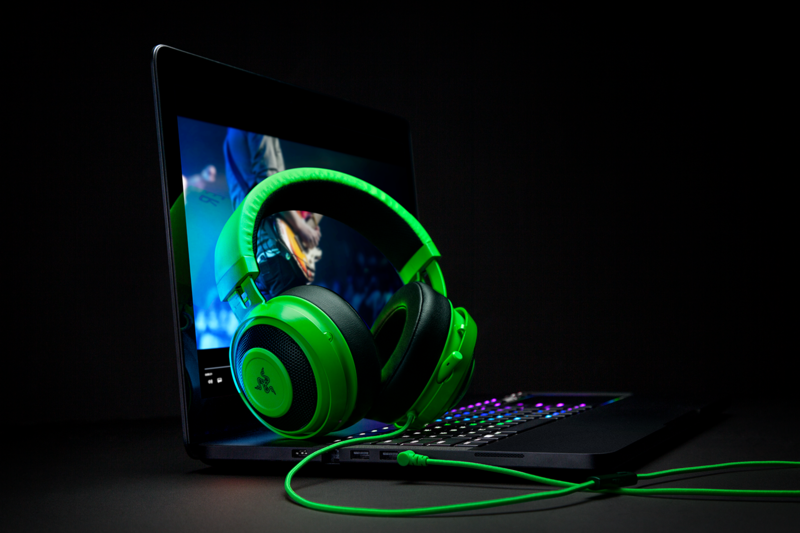 For even more performance, kick it into high gear by enabling High Performance mode in Razer Synapse and instantly overclock the Razer Blade Pro to 4.3GHz to tackle the most intensive tasks, all in a thin form factor. 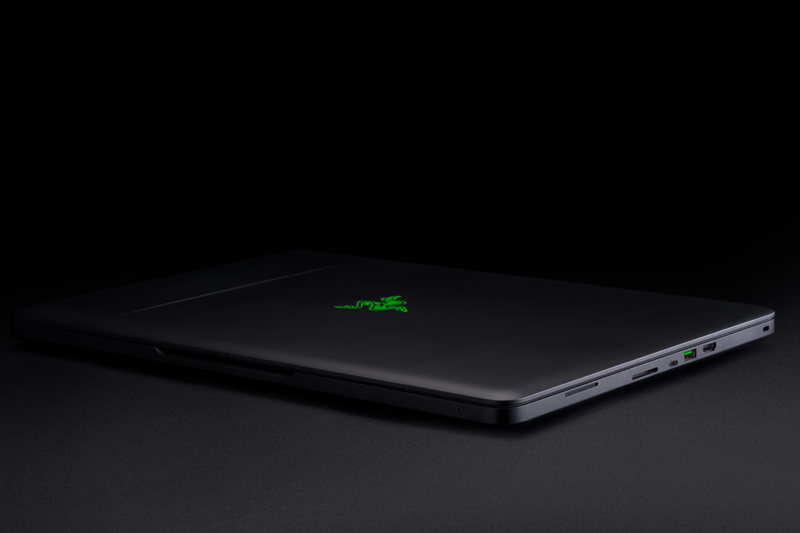 The New Razer Blade Pro is built for extreme performance. Loaded with 32GB of DDR4 dual-channel memory at 2667Mhz, providing faster and more efficient system performance to tackle multiple tasks. Boot and load your games and applications in a matter of seconds with blazing fast dual PCIe SSDs configured in RAID 0, with capacities up to 2TB. 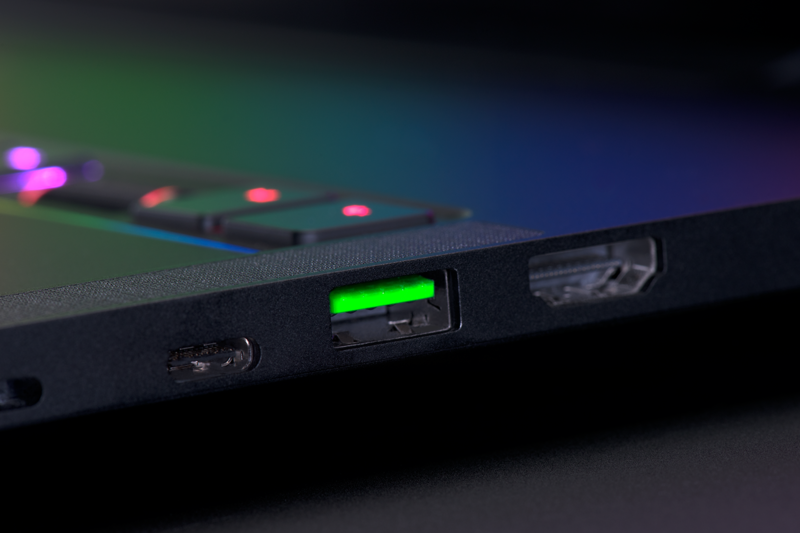 The Thunderbolt™ 3 technology in the new Razer Blade Pro brings Thunderbolt to USB-C at speeds up to 40 Gbps, creating one compact port that does it all. With the ability to connect to USB, Display Port, PCI Express, and Thunderbolt devices it is the most versatile connection available. A single cable now provides four times the data and twice the video bandwidth of any other cable, perfect for gaming and editing 4K content via external displays. Watch, play, and create in eye-popping 4K UHD resolution on the 17.3-inch state-of-the-art IGZO (Indium Gallium Zinc Oxide) display. Large screen real estate and 8.3 million pixels allow you to experience everything in stunning visual clarity, whether you’re playing the latest PC games, being immersed in 4K content, or creating your latest masterpiece. Experience amazing color saturation with the 17.3” 4K UHD display featuring 100% Adobe RGB color space coverage. Images are bright and clearly visible with wide viewing angles of up to 170 degrees. 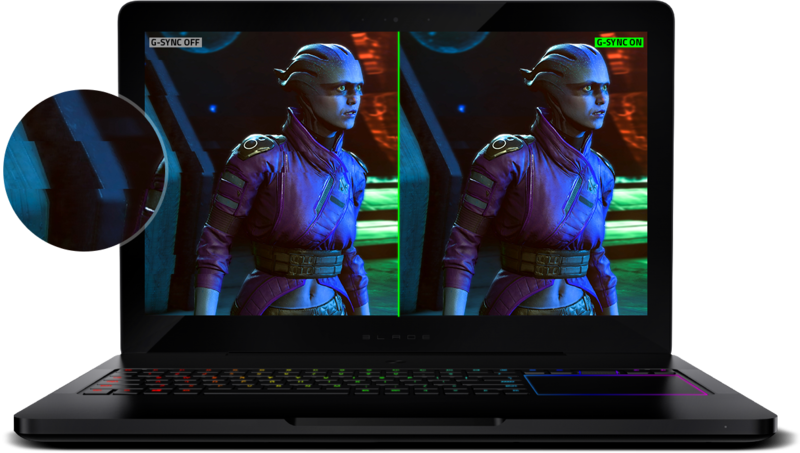 Whether developing your next game, editing photos or videos, or creating your next 3D printable object, the Razer Blade Pro was designed for the ultimate visual clarity. 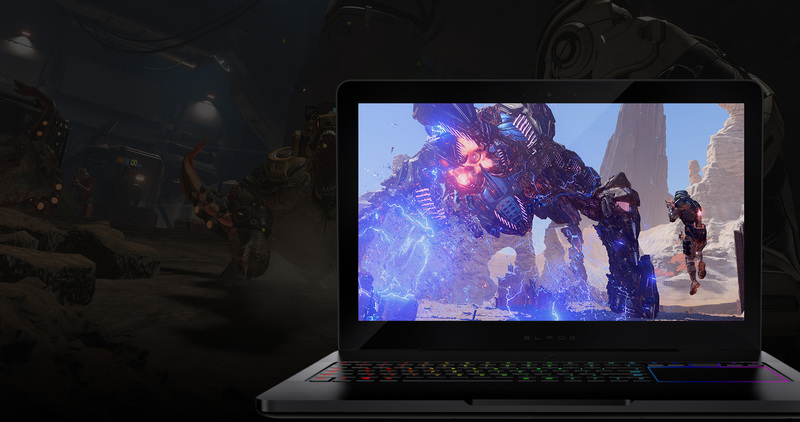 NVIDIA G-SYNC display technology delivers a breathtaking gaming experience through the elimination of screen tearing by synchronizing the display refresh rates to the GPU. The result is less screen stutter, smoother and faster gameplay to give you the best gaming visuals and a competitive edge. Experience amazing color saturation with the 17.3” 4K display featuring 100% Adobe RGB color space coverage. Images are bright and clearly visible with wide viewing angles of up to 170 degrees. 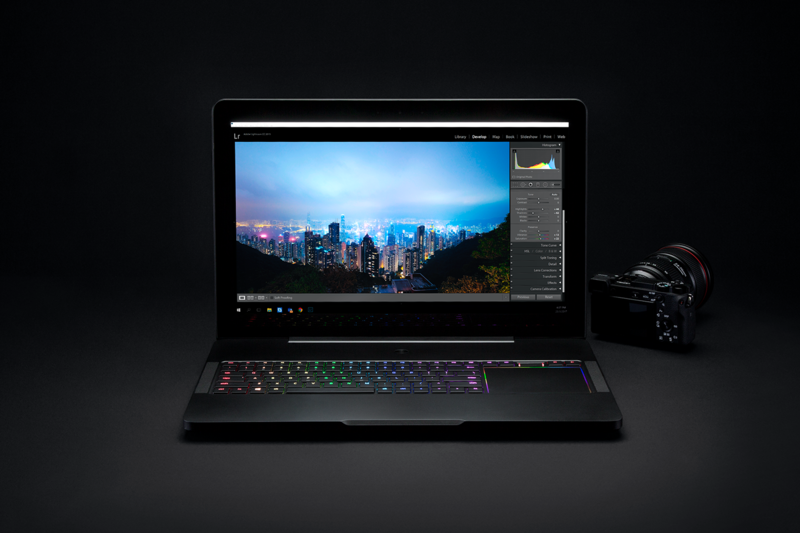 Whether developing your next game, editing photos or videos, or creating your next 3D printable object, the Razer Blade Pro was designed for the ultimate visual clarity. Play like a pro, type like an expert. 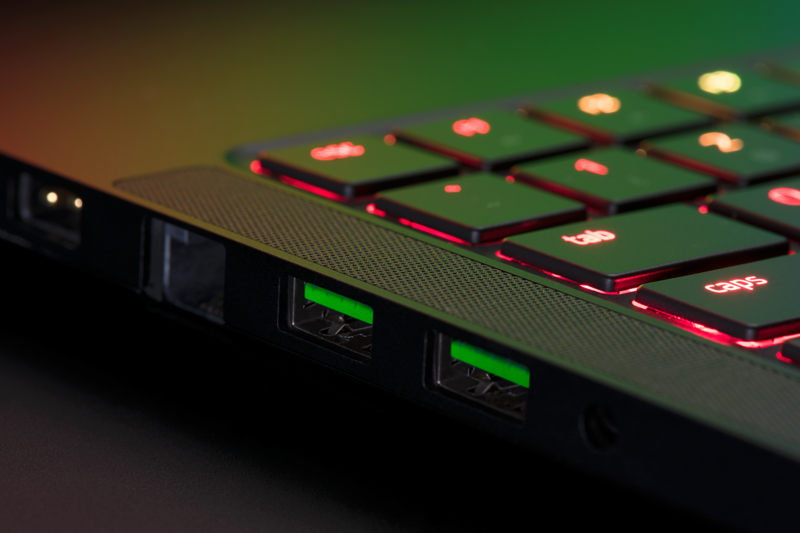 The ultra-low-profile mechanical keyboard of the Razer Blade Pro was built from the ground up to bring you an uncompromised desktop grade experience that feels tactile, accurate and responsive for work or play. This revolutionary technology with slim chiclet keycaps raises the bar for ultra-mobile keyboards. 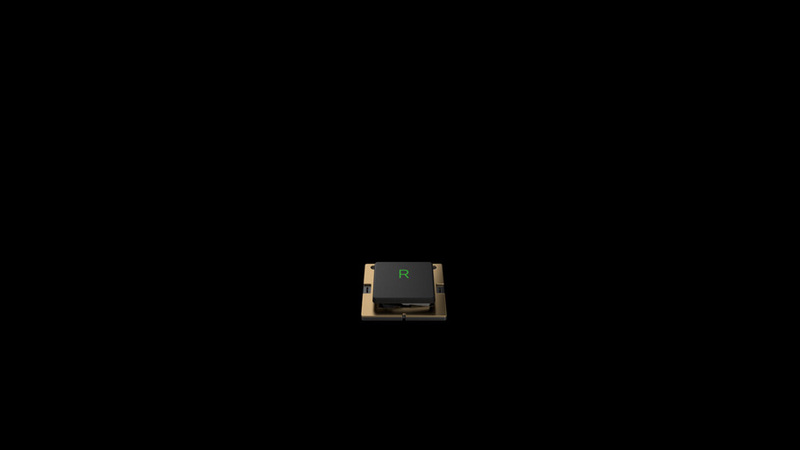 Featuring anti-ghosting capabilities, optimized reset points and an actuation force of 65g, the world’s first ultra-low-profile mechanical switch delivers the same performance and clicky feel as a traditional mechanical keyboard. 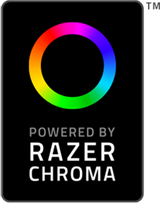 Light up your world with Razer Chroma™. 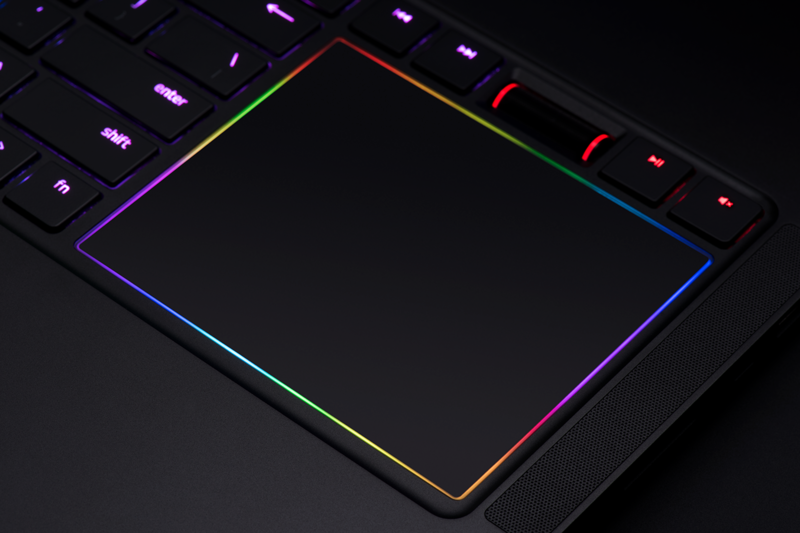 Featuring the full spectrum of 16.8 million colors with vibrant lighting effects, the individually backlit keys and trackpad on the new Razer Blade Pro offers endless possibilities for customization. 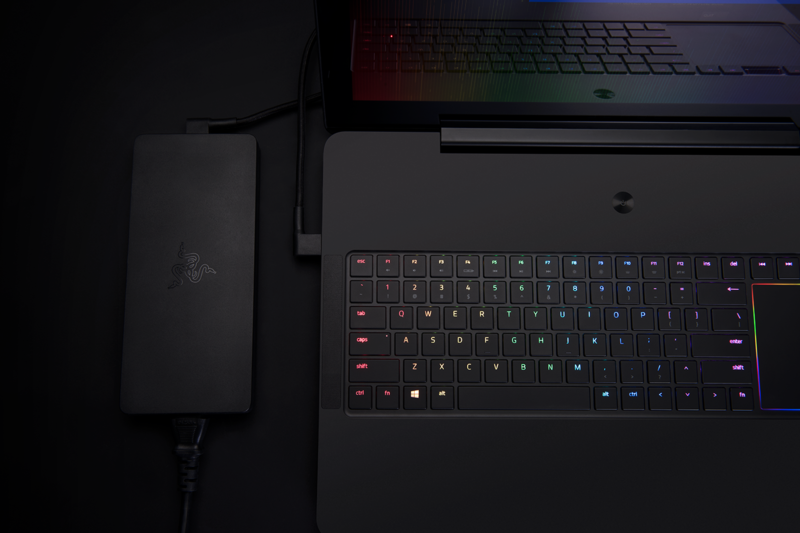 Use the Razer Synapse software to easily choose your preferred lighting effects or synchronize all your connected Razer Chroma-enabled devices. This lighting effect feature is only available in desktop view. You’d never imagine that all this power can be packed into a 0.88” thin CNC aluminum unibody chassis, but we’ve done just that. The result is a machine that is both refined and relentless. Pushing the boundaries of performance in a thin form factor design requires a super-efficient thermal management solution to keep the heat at bay. To survive the heat of the most graphically intense battles, the Razer Blade Pro utilizes an innovative custom cooling design. Dynamic heat exchange coupled with bleeding edge vapor chamber technology spreads heat out quickly, evenly and efficiently. To avoid “hot spots” the thermal design facilitates air movement within the chassis to deliver a cool and comfortable experience, whether you’re gaming on ultra-settings in 4K or rendering high resolution 3D animations. 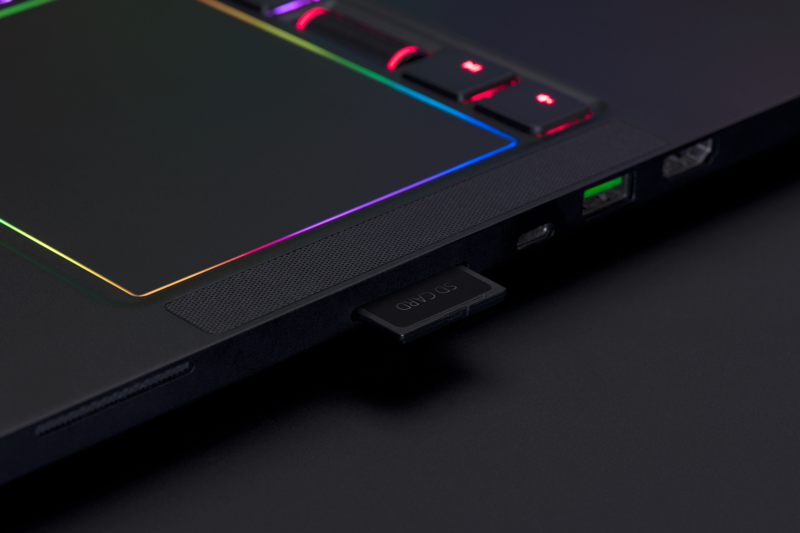 Connect your devices, peripherals or accessories with more ports than ever. Designed as a portable powerhouse, the Razer Blade Pro is an uncompromising machine that you can take anywhere you go. To match its incredible performance and portability, the 250W power adapter was built to be just as sleek, slim, and durable while delivering all the power to drive this machine. The perfect travel companion. 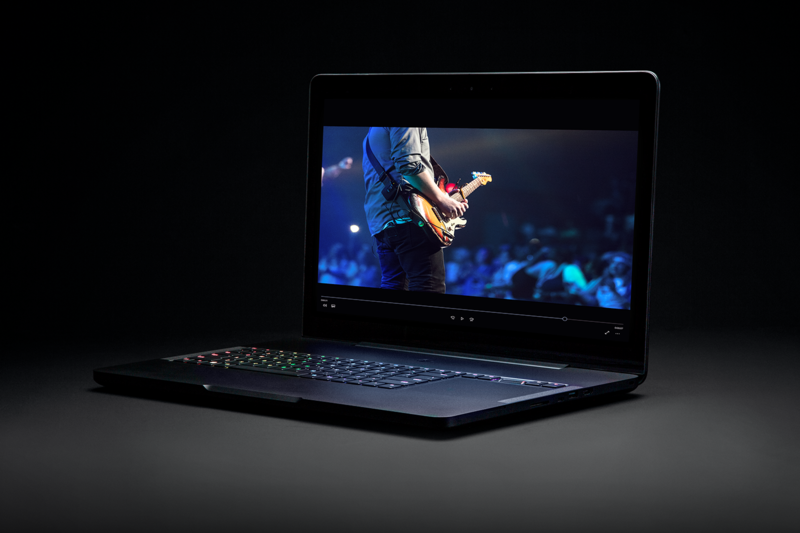 The Razer Blade Pro is the ultimate weapon of choice for both gaming and music production. To help arm your creativity, owners of the Razer Blade Pro are eligible for a free download and full license of FL Studio 12 Producer Edition – one of the most popular professional music production suites for PC. With the Razer Blade Pro’s performance and Image-Line’s award winning production software, it’s never been easier to take your music from the studio to the main stage. Learn more about how top music artists, including Deadmau5 and Metro Boomin, make music with video tutorials, music samples, and more – all on music.razerzone.com. 1) Features only available in supported games in Xbox Live-supported countries, see xbox.com/live/countries. Limited number of games available in 2015 support cross-device play; additional games to follow. 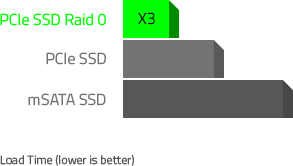 Stream to one device at a time; Streaming with multiplayer from Xbox One requires home network connection and Xbox Live Gold membership (sold separately); Gold also required for multiplayer play on Xbox One. DirectX 12 only available with supported games.